Photo by Abraham Pérez/Mexfoto. Used with permission. Tense situation continues in Huajimic after land restitution; Wixaritari and ranchers ask for government intervention to resolve one of Mexico’s oldest and most dangerous land conflicts. 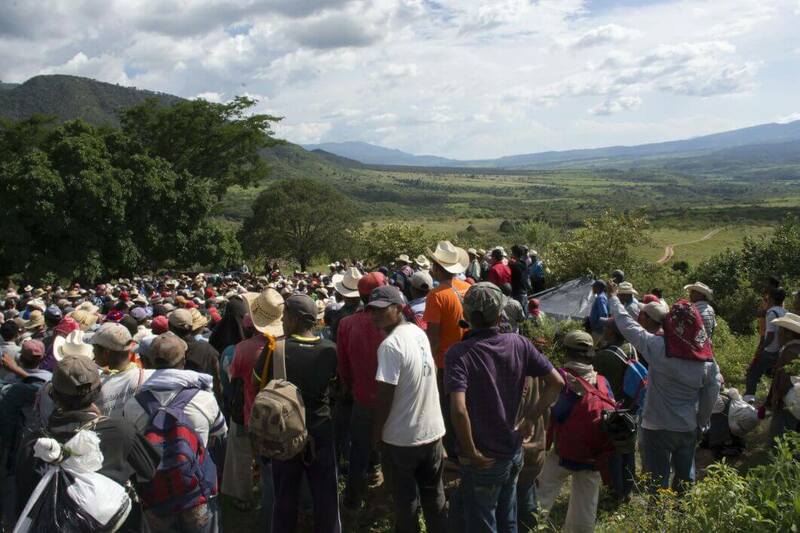 The human avalanche began to flow from the ridgetop of the Sierra de Los Pajaritos around 10 am on Thursday, September 22: 500 indigenous Huichols, heirs to the old lords of the mountains, descended in a quiet tide into the valley Huajimic, in search of historical justice. The expectant landholders, who had succeeded them in the domain of these lands, observed them worriedly as an ominous sign. It was the beginning of the land restitution most feared by the ranchers: it was just 184 hectares owned by Mrs. Enriqueta Montoya that were turned over by the Agrarian Court 56 of Tepic to the Indigenous Peoples, but it was the first of 47 possible restitutions—all without public law enforcement, as both the state of Nayarit and the federal government had ignored the request of the magistrate to be supported in order to prevent acts of violence. 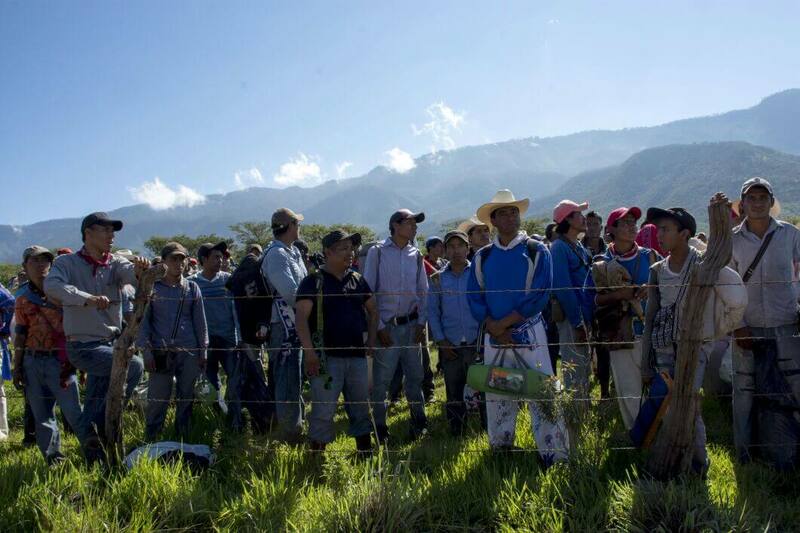 “We will not intervene with Cosomer [Social Conflicts in Rural Areas] unless there is blood or violence,” Gustavo Cardenas Monroy, the federal undersecretary of agrarian development, had told the lawyer representing the Huichol community, Rubén Ávila Tena. Avila Tena attested to the good intentions of the authorities of Wuaut+a, who had stressed to diverse audiences the need for the government to compensate their adversaries, who have three to five generations inhabiting this inter-mountain valley where they have made livestock thrive, with 7,000 head annually for sale. He alluded to the interviews held in recent months with the official of the Ministry of Agrarian, Territorial and Urban Development (Sedatu), who was reluctant to acknowledge the historical responsibility of the federal government in this land conflict, one of the oldest and riskiest in the national geography. What was certain was that the process of restitution of the property to the indigenous community of San Sebastián Teponahuaxtlán (Wuaut+a) as a result of the agrarian judgment 769/2012 ended five hours later. 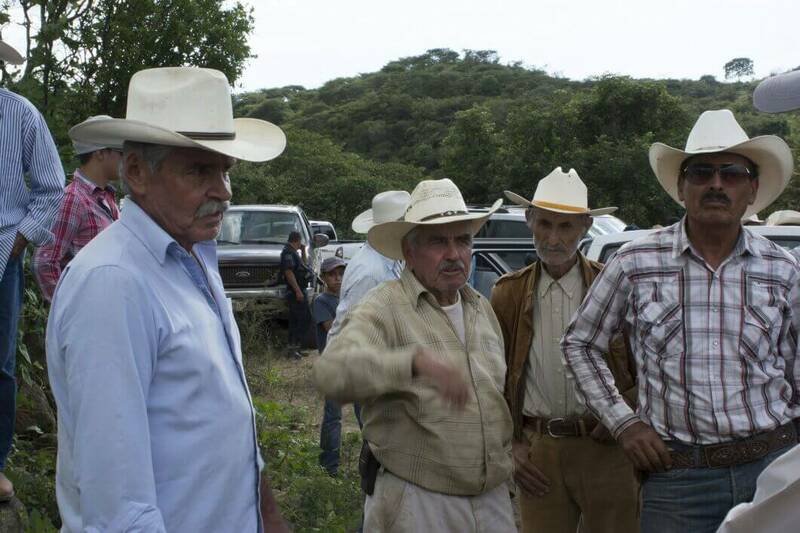 The affected ranchers, who fear a domino effect on the execution of judgments favorable to their neighbors, watched with growing impatience the administrative act of the court officials who headed the tribunal, Nereida Ceja and Enrique Ramírez. Between the bureaucracy of Sedatu and the disinterest of those affected, motivated by the government of Nayarit’s position of “not allowing” the “dispossessions,” four years had passed. The federal government has remained on the margin. The riskiest stage of the restitution has begun, without any institutional support that would allow for reconciliation. The “mother” title of the small landholders dates from 1906, when land reforms were in force and “idle” lands were “reported” in a legal process that allowed seizure of lands owned by indigenous communities and the Catholic Church; but this formality was outlawed by Article 27 of the Constitution issued by the Mexican revolution in 1917. The constitution in force for the past 99 years has allowed hundreds of communities in the country to reshape their heritage, but bureaucracy, neglect and remoteness caused a delay of 36 years before ending with a presidential decree for Wuaut+a. And today, some 16 thousand hectares remain without being restituted, said Miguel Vázquez Torres, President of Communal Lands for Wuaut+a. The fact that justice has been delayed reached the valley of Huajimic, a century-old town made up of mestizo ranchers, who argue their rights are based on their possession of the land for decades, the existence of deeds and ejidal decrees issued by local and federal governments, and their capacity to work. 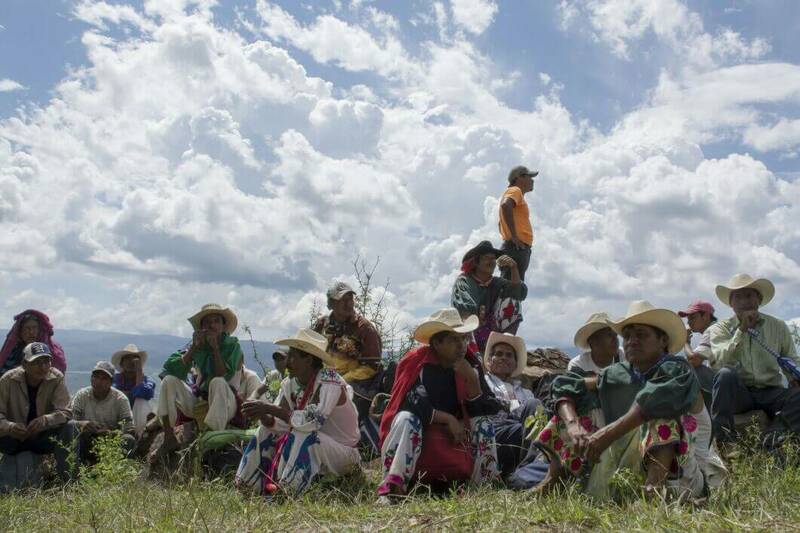 The Wixaritari take shelter in the Mexican agrarian law, which makes “imprescriptible, inalienable and unalienable” the communal patrimony, and the basic principle of “first in time is first in rights.” They still await the return of 16,000 hectares, 10,000 of them in Huajimic. Ranchers block the road leading out from Huajimic and detain journalists, lawyers and court officials for five hours. Photo by Abraham Pérez/Mexfoto. Used with permission. Other positions were more moderate, and many opted to shift the blame for the conflict to the political sphere: “This is a huge invasion by the state of Jalisco, and it will do away with this cattle-producing area; it is important that the federal government take action on the matter, it is urgent, we are in a dangerous situation, right now the government of Nayarit and the army is coming to support us,” rancher Gabriel Muñoz de la Peña commented at the beginning of the administrative action. The hearing was generally peaceful, although the group of ranchers wanted to “bust it up” with the accusation that a few hours before the event, individuals had passed by wearing military clothing and carrying weapons for the exclusive use of the Army (AK-47 and R-15). They said they had evidence, but they showed to the media only a picture of an unidentified individual who had a shotgun. 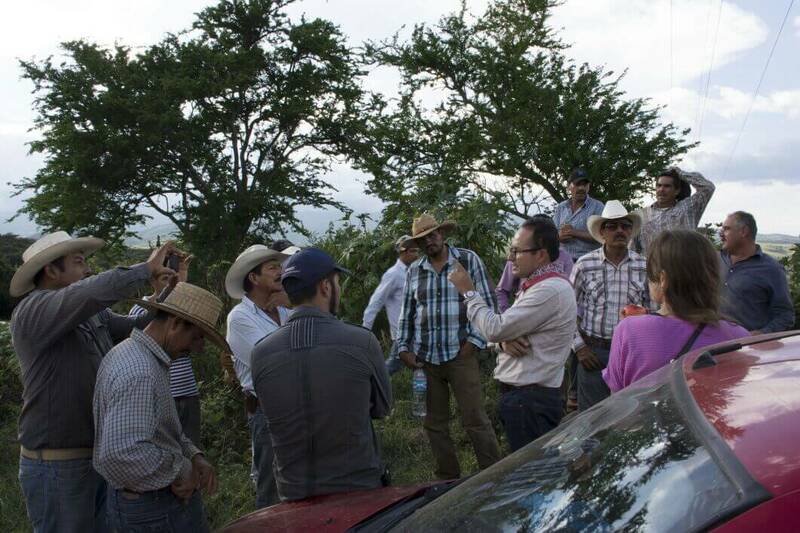 Huajimic municipal delegate Manuel Gonzalez Rodriguez confronted the communal authorities saying that his community members had been threatened, but Miguel Vázquez, repressing his annoyance, denied it. The actuary in charge, Nereida Ceja, demanded order and asked the municipal official to proceed with the fieldwork, under the warning not to allow anyone to exhibit a weapon during the process. The administrative action was completed after five hours; the field was marked with GPS coordinates and a count of the livestock was made – 80 head of cattle, which were left in the care of the Wixaritari. They advised that during the coming months, all of the 3,600 community members will fulfill the responsibility of carrying out vigilance to avoid disturbances. Farmers began to withdraw, and after them, court officials, reporters and attorneys. The surprise was waiting about four kilometers down the road toward the town. At a crossroads, trucks had been stationed to prevent passage. The vehicle carrying the officials was stopped and its occupants asked to step out; then came the first group of journalists and confusion reigned. Whole families of Huajimic were present. They wanted to show their irritation at the execution of the sentence, which they see as a historical injustice. They all would stay there between 4:45 and 9:50 pm. Police cars from the La Yesca municipal police and Nayarit state police were a few meters behind, but the police merely looked on. The rough dialogue that followed reached some agreements: This Sunday a commission with representatives from the Huichol community and another representing the ranchers will meet in Puente de Camotlán, so that together, they can put pressure on the federal government so that bloodshed can be avoided. “Otherwise, it is impossible to continue with the restitutions,” said Ávila Tena. The roadblock lifted at about 10 pm. Two days later, the tensions remain. The community Wuaut + a reported yesterday that the position of the most radical among the Huajimic landowners led them to take captive a group of Huichols who had come to town to buy food. The responsible party was reported to be the owner of a grocery business in the town, Audelina Villagran. At the time of publication, the government of Jalisco was being solicited to assist with the release of those affected.